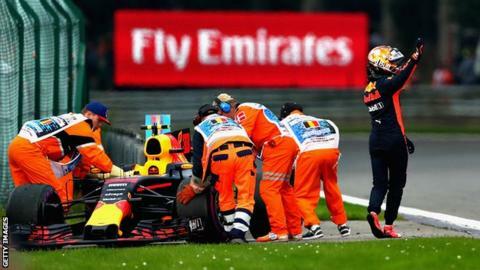 Red Bull's Max Verstappen has said his team's poor reliability is "unacceptable" in the wake of his latest retirement from a grand prix. He retired for the sixth time in 12 races at the Belgian GP, running fifth in front of 100,000 of his fans. "It is very frustrating," Verstappen said, "and especially in Belgium with lots of Dutch fans. "To retire after eight laps is not acceptable. You can't call it bad luck. It is very bad." Verstappen's latest retirement was caused by a problem with the team's Renault engine, parts of which have accounted for half his failures to finish. He has also had two crashes and one brake failure. "At the moment I am not a happy person," he said. "We will speak with the team and hope to do better in Monza [the next race on Sunday]." The issue is causing rising tensions between Red Bull and Renault, heightened by the fact the team are already unhappy because the French company's engine's lack of performance is preventing them from fighting consistently at the front. Team boss Christian Horner said: "It really hurts and it really hurts Max because he's at his home race, huge support, he's in a great position and his engine has failed on him. That is hugely frustrating for him and of course the support group he has around him. "That needs to change but unfortunately as a team it is an element that is beyond our control. So all we can do is put pressure on our supplier and say come on, get your act together." Horner added that Renault were struggling with reliability across all three teams - their own factory team and Red Bull's junior team Toro Rosso. "Reliability across the three teams is pretty dire," he said. "Turbo failures with Kvyat, engine replacements that have had to happen on two cars before we've come here and it's not great. It's far from great. "It is not at the level an engine supplier wishes to be competitive should be at. Now, they are working hard at it and hopefully putting in processes to avoid the kind of issues we're seeing." Renault admit they are struggling with reliability and are hopeful they will be able to solve the issues with both competitiveness and reliability for next season. Horner said Red Bull would have engine-related grid penalties at the Italian Grand Prix next weekend. Red Bull refused to confirm which driver they would apply to but it is believed Verstappen's team-mate Daniel Ricciardo will be hit by them and probably start from the back.